Enough snow for ya? ;) Thanks so much for the nice comments on Winter Brunch – I can’t wait to see some other ones knitted up. On Sunday we went to a friend’s house for a Superb Owl party. It was, indeed, owl-themed. There was “a” super bowl playing (from 1976), loads of food and fun. Thanks for the awesome party Yvonne, Jeremy and Booker! Check out this AMAZING snack stadium they built! Truly awe-inspiring. Sunday night the snowstorm blew in and I haven’t left the house since. I’m just fine with that, I’m such a homebody! 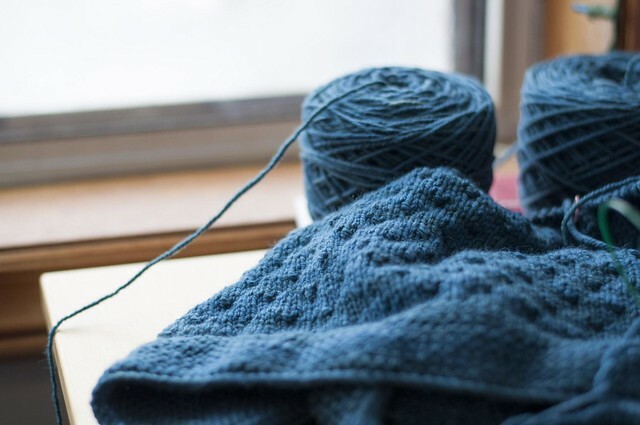 As long as I have coffee, the internet, and knitting, I could probably stay home forever. Plus, we just got a new bigger bed with nice new sheets and big fluffy pillows, which makes getting out of bed pretty difficult! 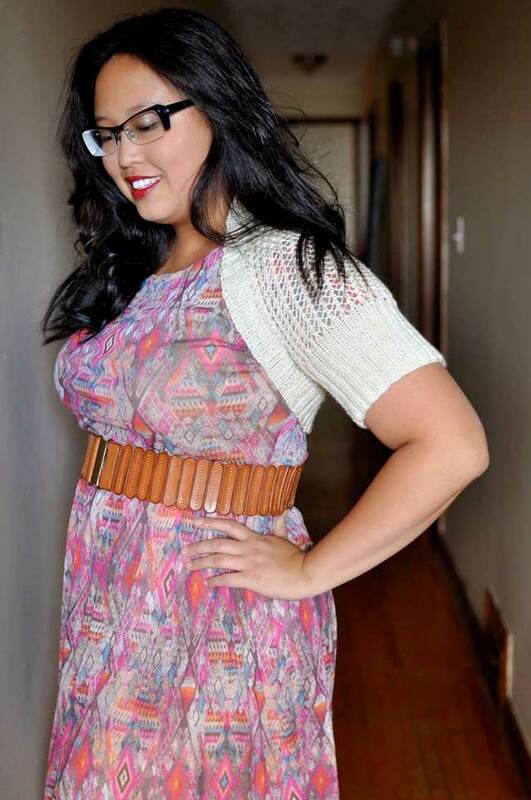 But I have been trying to take advantage of the time to buckle down on some bigger projects that have been lingering. 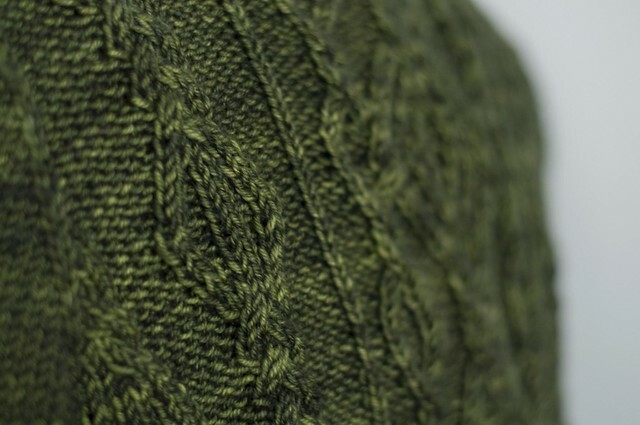 I finished one piece, out of Zen Yarn Garden worsted – cabley goodness. Yesterday I knit a whole sleeve while finishing up my read of 1Q84 (Haruki Murakami), which was super long but very enjoyable. Eating: I made a pretty awesome sausage pasta sauce last night! Quickie recipe: brown 1lb sausage, casings removed (ours was honey garlic pork), take out of the pan. Saute 1 onion, 2 carrots, 225g package cremini mushrooms, chopped, plus a couple cloves of garlic, minced. Deglaze the pan with some red wine (scrape up the browned bits from the sausage), season with salt, pepper, oregano. Add back the sausage and 1 bottle passata (or crushed tomatoes), cover and simmer the whole thing for maybe 20-30 minutes, while you boil the pasta and clean up. Serve over pasta with mozzarella! Yum. That snack stadium is awesome and your sauce sounds wonderful! We had snow in the Plains too–sadly I could not spend the day with such yummy yarns! 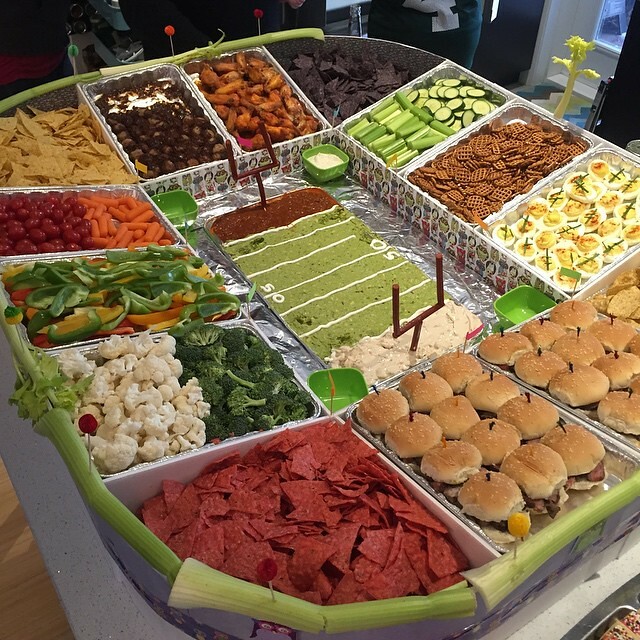 So clever-a snack stadium! Love it. And love the pasta sauce recipe.